I'm going to skip Nom Nom Monday today, because it's October first, and do my monthly wrap-up for September! Wow, another month gone in a flash. I'm certain I say that every month though. Since I'm skipping cooking, I figured I should start with my Nom Nom Mondays from the last month. I ate the last little bowl full of my homemade Con Queso for dinner, and it's still dang good. That was definitely my favorite recipe this month. Though the Sopapilla dessert was tasty, and made a fantastic breakfast on the go as well. The Peanut Butter Doggie Biscuits were fun to make, and it's a super bonus that the dog extra enjoys them as well. The Artic Ants on a Log are a simple, but filling snack. For Thirsty Thursdays I mostly made Tequila drinks this month. Aaron bought us a bottle of Herradura Tequila, which is a great blanco super smooth liquor. It's really not needed to mix with anything, but when making cocktails with tequila this is a brilliant choice. I made a Pineapple Mint, and a Lemon Watermelon tequila cocktail. My favorite was my new version of a Tequila Sunrise, below on the right. 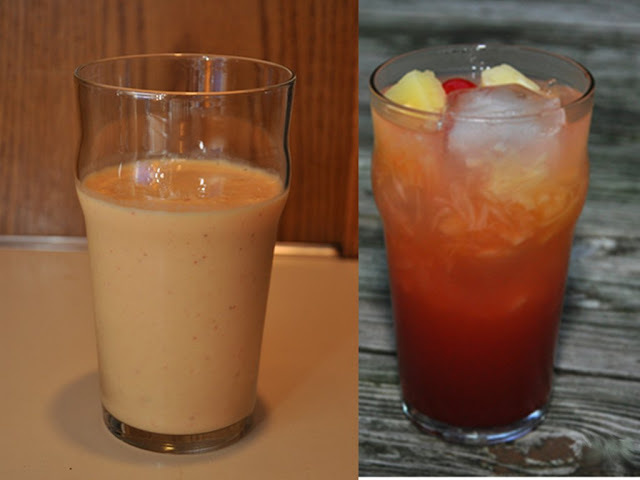 I also enjoyed the non-alcoholic Orange Julius that I made up, below on the left. I've been doing a good job keeping up with my DIYs. I wrote two posts on making over bad canvases into something useful, Part I and Part II. I've been working on making some outdoor Halloween decorations, and I started off with a two part Homemade Tombstones Part I, and Part II. I really enjoyed putting together a care package for my brother in Haiti. I started off by giving a Brown Box Make-over, and then making him a Manly Card. I also really liked my DIY facial mask. I want to make another one this week! I started and ended the month with two nails dos. I think I like the yellow and white nails better than yesterday's fall paint job. I only managed to sneak in two outfit posts. I like my coral jumper, but I like the casual outfit pictures better. I've had a lot going on this past month. We went to a lovely wedding in D.C. for Aaron's cousin's wedding. I've been super busy with packing my crafts to be moved, and packing for our Vermont trip, for our friends' wedding. My favorite post from this month was my post on positivity, self confidence, and yoga. Wow I still have to do some laundry, so that's all for today. Happy Monday, and happy DIYing, chris! Hi! I'm happy you're here! If you'd like to learn more about me, click on the above image, or the 'About Me' tab. Thanks for stopping by! Theme images by imacon. Powered by Blogger.